"Lady and the Tramp", 1955. Original Vintage Movie Poster Half Sheet. Terrific vintage Disney movie poster. RARE rolled , very good condition. NO fold Lines as with most half sheet movie posters. Has some border wear and a few border tears. 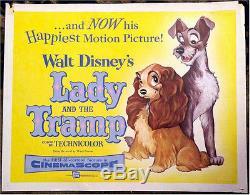 See enlargeable image above Lady and the Tramp (Buena Vista, 1955). Half Sheet (22" X 28"). Starring the voices of Peggy Lee, Barbara Luddy, Larry Roberts, Stan Freberg, Verna Felton and Alan Reed. Directed by Clyde Geronimi, Wilfred Jackson and Hamilton Luske. One of the prettiest pieces on the first all-cartoon feature in Cinemascope. A unique opportunity to get an unfolded piece on this title, which is significant, due to the usual horizontal fold going right through Lady's face! Just some light edge wear. The item "DISNEY'S LADY AND THE TRAMP HALF SHEET VINTAGE MOVIE POSTER" is in sale since Saturday, July 1, 2017. This item is in the category "Entertainment Memorabilia\Movie Memorabilia\Posters\Originals-United States\1950-59". The seller is "cvtreasures1" and is located in Saint Augustine, Florida. This item can be shipped to United States, Canada, United Kingdom, Denmark, Romania, Slovakia, Bulgaria, Czech republic, Finland, Hungary, Latvia, Lithuania, Malta, Estonia, Australia, Greece, Portugal, Cyprus, Slovenia, Japan, China, Sweden, South Korea, Indonesia, Taiwan, South africa, Thailand, Belgium, France, Hong Kong, Ireland, Netherlands, Poland, Spain, Italy, Germany, Austria, Israel, Mexico, New Zealand, Philippines, Singapore, Switzerland, Norway, Saudi arabia, United arab emirates, Qatar, Kuwait, Bahrain, Croatia, Malaysia, Brazil, Chile, Colombia, Costa rica, Panama, Trinidad and tobago, Guatemala, Honduras, Jamaica.